Ari's personal favorite tinned tuna. Here in the U.S., tinned tuna is a low-end commodity usually sold in supermarkets. In Spain it’s at the complete opposite of the culinary spectrum. 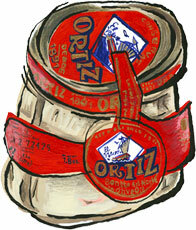 Tuna in tins, especially these from fourth-generation family firm Ortiz, is one of the jewels in the country’s culinary crown. The best cuts of the fish are line caught, hand filleted on the boat and quickly jarred in good olive oil. The olive oil adds flavor and makes the texture silky over time, unlike water, which tends to leach flavors from the fish. Yellowfin, aka Atun Claro, is Zingerman's founder Ari's personal favorite. Its flavor is fuller and richer than bonito, our most popular tinned tuna. It's not exactly cheap, but it makes for fine-tasting convenience food. A quick turn of the lid, and you can serve tuna like this with salads, appetizer platters or just on its own, dressed with a top-notch olive oil and a sprinkling of sea salt.